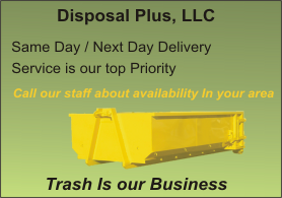 Disposal Plus is committed to providing affordable and reliable dumpster rentals for homeowners and do-it-yourselfers. Call us and let us earn your business! Professional and courteous customer service to assist you in determining what dumpster rental is right for your project. Competitive pricing to suit the needs of homeowners and do-it-yourselfers on a budget. Hassle free scheduling, delivery and pick up. Family owned and operated - We care about your needs!